SUB-1 GHz TRANSCEIVER +UFL CON. The SPSGRFC is an easy-to-use sub-1 GHz transceiver certified module with many programmable features. The module provides a complete RF platform in a tiny form factor. The module can operate at the 433, 868 or 915 MHz frequency band, SPSGRFC-433, SPSGRFC-868 and SPSGRFC-915, respectively. 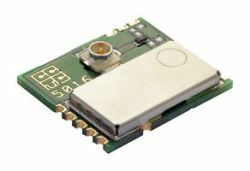 The SPSGRFC RF module is CE, FCC and IC certified and integrates wireless connectivity in target electronic devices without requiring particular RF experience or expertise. This certified solution optimizes the time to market of the final applications. The module is designed for maximum performance in a minimal space, with 4 programmable I/O pins and an SPI serial interface. The SPSGRFC is pin to pin and firmware compatible with SPSGRF family.